A California State Senate committee held a hearing yesterday on SB 520, a bill that in its original form mandated 50 online courses at UC, CSU, and the community colleges. 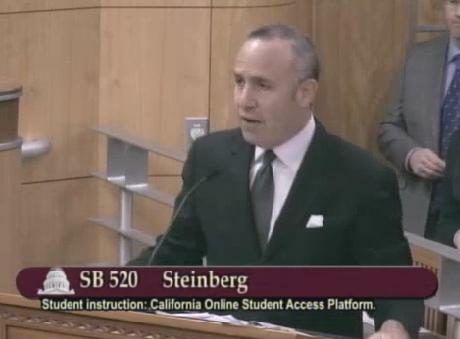 The bill is being pushed by Senate President Steinberg. At the hearing, he offered amendments setting 50 as a goal rather than a mandate and allowing “public-public” partnerships as opposed to public-private. The latter refers to deals with private MOOC companies. Public-public would include, for example, cross-campus courses. He also offered an amendment that no public monies would be used for the private side of any public-private partnerships. (It’s not exactly clear what the last would mean as a practical matter since money would come from both sides and whose was whose might be hard to define.) After the hearing, the committee asked for written versions of the amendments rather than the oral descriptions offered at the hearing. However, it was clear that the bill would eventually move ahead. http://calchannel.granicus.com/MediaPlayer.php?view_id=7&clip_id=1176 (and be patient while it loads). Previous Previous post: And the good news is…?